A digital revolution in agriculture is transforming the way in which farmers and other agricultural stakeholders operate, and could reshape the way farmers address emerging pests. At present, in sub-Saharan Africa, the fall armyworm pest has and continues to damage farmers’ livelihoods and crops across the region. Facing this new, invasive species, farmers are attempting to combat the pest using a variety of different methods such as pesticide application, manual squishing, and mixing soil and ash into maize whorls. 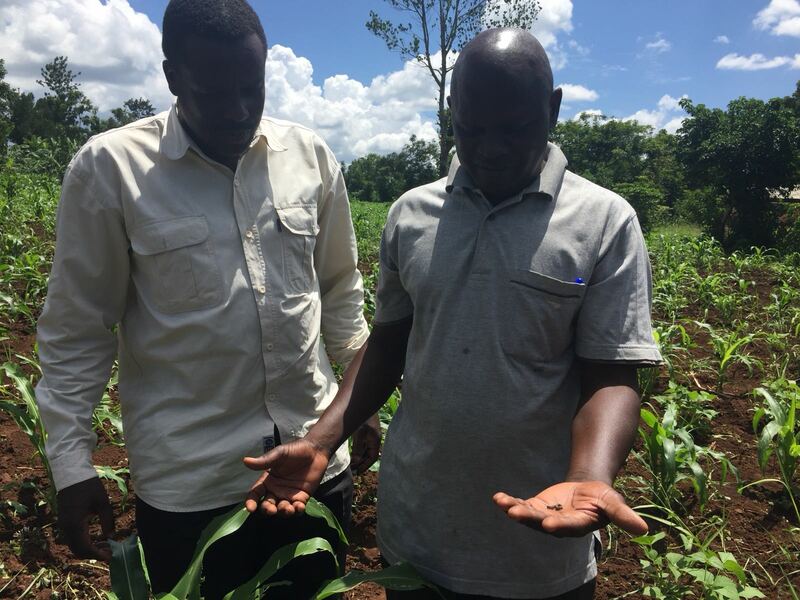 Digital solutions provide a unique opportunity to support these efforts and empower farmers with the information they need to detect and stop the spread of the fall armyworm. Technology plays an integral part in emerging economies, as smartphone ownership and internet usage continues to climb at astonishing rates. There is no doubt that the adoption and growth of technology across Africa has been both swift and significant, as shown in Figure 1. The most recent statistics from GSMA (Global System for Mobile Communications Association) find that as of 2016 mobile technologies and services created $110 billion of economic value (7.7% of GDP) and further helped create 3.5 million jobs in Sub-Saharan Africa. This technological development in Africa has manifested in mass growth on an unprecedented scale leading to improvement in livelihoods. Across the continent, Africans have not only adopted technology, they are rapidly building it too. In 2016, there was an estimated 314 active tech hubs across Africa. Over 50% of them are in 5 countries: South Africa, Kenya, Nigeria, Egypt, and Morocco. Research shows that mobile telecommunications have a positive and significant impact on labor productivity growth. While the technology sector continues to grow, the majority of sub-Saharan Africans (65%) still make their living by subsistence farming. Traditionally, farming practices and knowledge have been shared via informal networks. Nonetheless, farmers grapple with questions for which they need accurate, timely, and actionable information. Farmers can benefit from information on inputs, tips about post-harvest storage, weather and water data, calculations for the best feed ratios to improve aquaculture yields, up-to-date market prices, forecasts of demand and the ability to keep track of what they sell and how much they earn. Digital solutions can help generate and share such information and can connect farmers with other value chain actors to communicate, educate, and transact. Indeed, this is already happening with many existing tech and agri-data businesses based in Africa providing innovative solutions and services to farmers and other agricultural stakeholders. UjuziKilimo is a Kenyan start-up using mobile phones as tools to transform farmers from a traditional to a modern knowledge-based agricultural community through the use of precision farming, data analytics, interactive SMS and climate smart farming. Farmerline is a Ghanaian organization that utilizes mobile and web technologies to increase smallholder farmers’ access to information such as weather forecasts and farming advice to improve productivity. Zenvus is an AgTech business based in Nigeria bringing together the use of electronic devices and analytics to empower farmers and increase their productivity. Agrocenta is an agri-tech start-up based in Ghana that is improving the agricultural value chain by introducing an online sales platform connecting smallholder farmers directly to an online market. Fall armyworm is a pest which has been devastating agricultural crops across sub-Saharan Africa since early 2016. In such a short period of time, the pest has already caused major crop damage and economic losses. Data and information regarding fall armyworm is fragmented and there is an issue in smallholder farmers being able to receive this information which is useful, actionable, context-specific and timely. Additionally, given the worm’s mobility, every day there are new developments in how farmers are dealing with this pest. Farmers need clear, relevant, frequently updated information. Digital solutions can fill this gap by connecting farmers with timely, context-specific, actionable information to identify, track and treat the incidence of fall armyworm. This is what Feed the Future’s Fall Armyworm Tech Prize is looking for: solutions inspired by new developments in digital technology that can provide information on fall armyworm to smallholder farmers, or those who support them. Such technology can include artificial intelligence, machine learning, interactive voice response, big data analytics, digital decision trees, SMS, digitally-enabled social networks, or other digital tools and approaches that may best serve smallholder farmers in tackling fall armyworm. And it is an extraordinary 1! That’s useful article for me.